"You don't have what it takes." Those words, spoken to Jack by his father when he was young, speak to Jack's inability to be a hero. 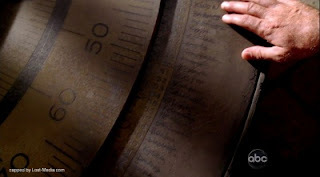 Lost is an ensemble show, but in many ways, Jack is the central character. The crash of flight 815 and its immediate aftermath was seen through his eyes, he's received the most character-centric episodes (with mixed results) and is the driving force behind many of the most significant events on the island. In fact, the grand narrative of Lost, at least from the perspective of the Losties, could be seen as Jack's quest to prove to his father he does have what it takes to be a hero. In the fifth episode of season one, spurned on by the memory of those words, Jack chased his father into the jungle, eventually finding the caves: shelter, water, and one of the island's earliest mysteries (the Adam and Eve skeletons). In the fifth episode of season six, Jack is mysteriously told he does have what it takes, and driven by those words once more, treks into the jungle with Hurley, once more coming across the caves before reaching Jacob's lighthouse. The Jack of season six is still almost as lost as the Jack of season one. Once a man of science, he turned to faith, believing returning to the island would fix him. With his master plan involving Jughead a seeming failure, Jack is as confused and broken as ever before. In the sideways world, Jack is also grappling with his father issues, though this Jack faces them from a different angle as he realizes his son looks at him the same way Jack saw his father. Because everyone seems better off in the sideways reality, Jack is able to heal the rift between him and his son before it grows too big. Much as sideways Locke won't let his disability define his life, sideways Jack won't let his father issues prevent him from maintaining a healthy relationship with his son. Perhaps sideways Jack, with his ability to move past his father issues, is the Jack Jacob is trying to lure to the island, a Jack who does indeed have what it takes. This is the 108th episode of the show. Another "are they channeling the other reality somehow?" moment as Sideways Jack's appendectomy scar triggers his Spidey sense. And a further indication of how different this reality is: his mother said his appendix was removed when he was a boy; Island Jack had his removed on the island in season four's "Something Nice Back Home". 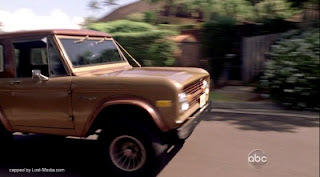 Sideways Jack drives the same jeep as Beardo Jack did in the season three finale. According to Lostpedia, Dogen's retort to Hurley in Japanese can be translated as "you're lucky that I have to protect you. Otherwise I'd have cut your head off." "I just lied to a Samurai." There is a bottle of MacCutcheon whiskey in Christian's office. Despite not crashing on the island together, the threads of the Sideways Losties continue to come together; it seems Christian's will might lead Sideways Jack to Sideways Claire. Sideways Jack read Alice in Wonderland to his son; Island Jack read it to Aaron in "Something Nice Back Home". Jack's son joins other musicians on the show such as Charlie, Daniel and Jack himself, who's been seen playing the piano from time to time. Hurley's comment about the Adam and Eve skeletons being someone we know that traveled through time is a nod to the many fans who have theorized as much. Clairesseau: ''If there's one thing that'll kill you around here it's infection.'' Zing! Claire said she was tortured and branded by the Others at the temple...which is how they diagnosed that Sayid was infected. More rabbits: Jack found the key to his ex-wife's house under a rabbit, just like Miles found the key to the dead guy's apartment under a rabbit in "Some Like it Hoth." 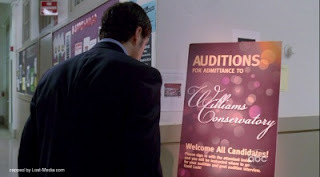 A sign outside the auditorium where David was auditioning read "welcome all candidates." Ha! David played the same piece by Chopin that young Daniel played in "The Variable" before his mother told him he wouldn't have time for music. Dogen's appearance in the flashsideways suggest he either came to the island after 1977, or else the differences between the two realities reach back farther than Jughead's detonation. The Looking Glass Dharma station guided people to the island; now we've seen the lighthouse, with its "looking glasses" that also guides people to the island. #20 on the lighthouse dial was assigned to Rousseau. Here's an updated list of the candidates, incorporating the lighthouse info. Jack's done a lot to frustrate me through the years, but I've never been more frustrated with him than when he smashed those mirrors. That it was later revealed to part of Jacob's plan did little to assuage my frustration. 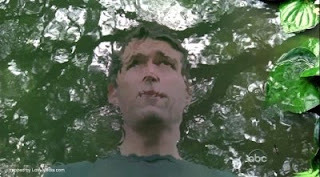 The main island plot of this episode mirrors the previous episode: a supernatural being (Smokey/Locke) triggers a trek across the island in the name of answers. In the last few minutes, a bit of the show's mythology is revealed, involving numbered lists of the main characters. More numbers: the numbers assigned to a candidate correspond to a degree on the lighthouse's protractor. Turning the mirrors to that number seemingly allows Jacob to observe the candidate. What's Kate's number? '51-Austen' can be seen on the dial. Is Claire crazy? Yes. 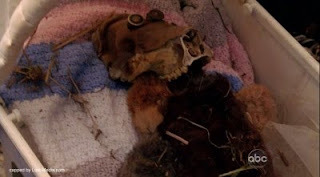 See: creepy skull baby. #108 on the dial was assigned to "Wallace" and crossed off, which probably means Wallace isn't coming to the island. Is someone else really coming to the island, or was Jacob just concerned with straightening out Jack's head? 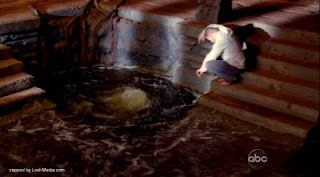 Was Jacob pouring something into the temple spring? There now appears to be two lists of candidates: the one on the lighthouse dial and the one in the cave. Are they both Jacob's? Is the one in the cave really FLocke's hit list? Who is David's mother? Jack's ex-wife Sarah (who's too busy with Modern Family to make an appearance)? Someone else? Is it even important? We know the Others didn't travel through time as the island jumped around at the beginning of last season. It would appear Claire didn't either; how come? The same reason the Others didn't (whatever that may be)? 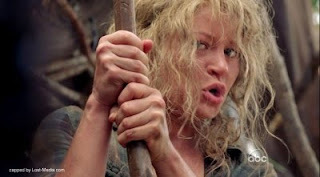 Clairesseau referred to her father and her friend as though they are two different people, but a popular theory is that the Christian who took Claire off into the jungle was a manifestation of Smokey. Does this suggest they are two separate entities, or just that Claire thinks of them as two different people and has never seen them together? Clairesseau seems able to see through Smokey's form (she knew it wasn't Locke but her friend); doe he appear to her differently? Does she just see him for what he truly is, regardless of his shape? 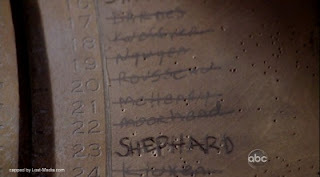 The lighthouse mirror showed Jack's childhood home; could that mean 23-Shephard refers to his father? The post-episode preview was even more cryptic than usual, but assuming the pattern continues (and judging from the title, it will) we'll probably catch up with Sideways Sun and Jin. On the island, perhaps Sun and Jin will finally be reunited. I always assumed the adam and eve skeletons were Bernard and Rose. I was so made when Jack broke those mirrors. THEY'RE MAGIC EFFING MIRRORS!!! You don't just smash them because you're mad! Yeah, Adam & Eve=Rose & Bernard has been a popular theory since even before time travel was introduced. It's as good a theory as any. I've also heard Jack and Kate, Kate and Sawyer, Jacob and Esau/Smokey, Locke and Jack...basically, any two characters you can think of. The producers have said that whenever they reveal who the skeletons are, it will be proof that they've had some of this stuff planned from the beginning. Frankly, I can't think of any "Adam & Eve are ___!" revelation that would prove such a thing, but whatever. Exactly! Argh, this is why Jack drives me nuts. I get that you feel like you've been manipulated and whatnot, but how about thinking things through, making sure your suspicions are correct, before throwing your little smashy smashy hissy fit? Speaking of this, someone mentioned that the torture - er, testing - of Sayid by Ghengis was much like the torture done to him by Rousseau. I wonder if she was in on the "zap 'em with electricity and look for 'x' to know if they're infected." So, do you think the infection and the MiB are two separate things? Who busted Claire out of the temple? They must have had her under close supervision. Good point. Maybe her "infection" made her stronger, made it easier for her to escape? 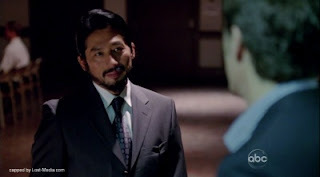 AND ANOTHER THING why can they actively go and kill Claire but not Sayid? Perhaps because Claire is no longer a candidate (assuming her candidacy came to end BEFORE she was infected and not as a result of the infection)? Maybe they CAN kill Sayid now that he's refused the poison, but they had to give him (and Claire, presumably) the choice at first? Oh, he could very well turn out to be a creep. I just don't think MiB will turn out to be any less creepy or evil. I wonder if she was in on the "zap 'em with electricity and look for 'x' to know if they're infected." She could be. She seemed to know a bit about the infections. Who knows what she picked up all those years in the jungle. I think they're separate but related. Obviously, "infected" means something other than having your form assumed by Smokey, but I definitely think there's a link between the two, even if it's as simple as being infected makes you more susceptible to Smokey's influence. So many things I've thought have already been written, damn you crazy witches reading my mind!!! I knew as soon as Jack broke those mirrors that he was supposed to break those mirrors but if you were trying to find answers, wouldn't you keep looking in the effing mirrors and turning the dial. Or at the very least, find out who Jacob wanted to look at in the first place?? Everyone on the island has daddy issues. Yeah, I still think that for all of Jack's rage at being seemingly manipulated, seeing a crazy magic mirror would, at least at first, trigger a different reaction than "smashy smashy".